Mention ‘Knott End’ and most people will think of the iconic Fleetwood to Knott End ferry – like fish and chips, the two are synonymous. Since the mid-1800s ferryboats have sailed across the Wyre Estuary, linking leafy Knott End and Over Wyre with the busy port of Fleetwood. And for generations, the ferry service has held a special place in the hearts of its passengers – locals and visitors alike. Those who relied on the ferryboat to get to work, school or the shops back in the 1940s, 50s and 60s, have fond memories of what could sometimes be a hair-raising journey. Back in those days, passengers got used to doing battle with the elements. Being buffeted by storm-tossed waves, becoming stranded by the tide on a sandbank, or hitching a piggyback ride across the mussel beds from a burly member of the ferry crew – these were the kind of adventures travellers took in their stride, in an era when health and safety was less of a priority than it is today. Preesall town councillor and former Wyre councillor Jean Mutch is one who can remember travelling to Fleetwood Grammar School on the ferry during the 1950s. She recalls occasions when the weather was so bad it caused the ferryboat Wyresdale to flip over on her sides. Ruth Bradbury, who also went to Fleetwood Grammar School, recalls making a perilous crossing in a stand-in ferry vessel brought in while the regular ferryboat was being repaired. Ferry negotiating the sandbanks on the way to Knott End. “It didn’t have any side rails,” she remembers. “There was just a little handrail around the top of the cabin roof, and it had narrow side decks with great big tyres all around the sides – and you sort of had to lean in against the cabin and hold your hand against the cabin rails as you went across – and there would be 30 or 40 of us children, clinging on. “And then when you got to the other end you had to climb up the pilot ladder to get off the boat. It was just a rusty, upright ladder, with metal rungs, and you had to climb up that with satchels on your back and holding your cookery baskets or hockey sticks. Today’s health and safety people would definitely not have approved. 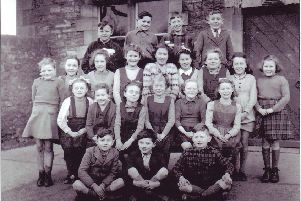 And there was no swimming pool in Preesall then so we couldn’t even swim!” It would be easy to imagine children today being stricken with terror at such an escapade, but not the hardy Over Wyre youngsters from those days.“It felt fantastic. We loved it! It was just a different world altogether but you just got on with it because that’s how you got to school,” recalls Ruth. Like several couples, Ruth and her husband, John, senior coastguard at Knott End, have the ferry to thank for bringing them together. He was a pupil at Fleetwood’s Bailey School at the time, travelling on the same ferry-boat to school every day. The ferry’s colourful history dates back to the mid-1800s when Knott End fisherman, old John Croft, and his sons took passengers across the estuary in their sailing and row boats. Sailings were haphazard, planned to fit in around the Crofts’ fishing and cockling commitments. In 1894, Fleetwood Council, after recognising the need for a commercial ferry service to strengthen links between the thriving port and holiday town and the Over Wyre farming community, took over the running of the ferry, hiring the Croft family to operate it. During the early part of the century, thousands of folk piled on to the ferryboats each week, many of them holidaymakers and day trippers seeking an escape from bigger, brasher resorts like Blackpool and Cleveleys. In 1905, a record 10,200 passengers streamed out from the ferry in just one day. Those making the journey had to be prepared to share space with ferrets, poultry, pigs and sheep, with Over Wyre farmers relying on the ferry service to transport livestock to Fleetwood market. Cows and horses would be attached by a halter to the ferry vessel and forced to swim across the river. Knott End resident Bob Croft is descended from the ferry founders – old John Croft and his sons, Robert, John and Thomas. He knows little about them, other than that they were a wild bunch, known for bickering among themselves. They were not averse to throwing punches midway across the river – much to the alarm of passengers – as they argued about whose turn it was to be skipper! However, Bob has plenty of his own memories to look back on. As a child, he was a regular traveller on the ferry during the heyday years of the 1940s, when passenger numbers reached nearly 250,000 in 1945. Back then, the well-known trio of ferryboats – the Wyresdale, Lunevale, Caldervale – ruled the Wyre waters, operating a morning-till-night service to take people to work (many Over Wyre people were employed in the Fleetwood fishing industry) or school. During the evenings, passengers would catch the late-night ferry home after going to the cinema or dances at Fleetwood Marine Hall. Bob recalls his grandma, Beattie Croft, taking him across the ferry as a youngster. “We’d take the ferry to Fleetwood and on coming back there would be a queue of four or five people standing abreast, going all the way up the ferry slip to the ferry office and stretching back as far as the old tram track,” he said. Being forced to land on the mussel beds during low tide is something many people remember with a smile. Passengers faced having to walk across the muddy sandbanks in their wellies or accepting a piggyback ride from a burly ferry crew member. Jo Durbano, who worked in an office in Fleetwood, can remember being thankful of a piggyback ride, instead of having to walk across the mussel beds in her flimsy office shoes. Crossing the estuary in dense fog could also be precarious. The ferry skipper had to rely on the sounds of a bell being rung from the Knott End slipway to guide the vessel in. The task of bell ringing would fall to the ‘sweeper of the tide’ – the ferry worker whose job it was to keep the ferry slip clear of sand and debris. Passengers on the current ferry, the 34-seater Wyre Rose, operated by Wyre Marine Services and skippered by father and son Tony and Philip Cowell, are less likely to face the adventures passengers of earlier decades regularly encountered. Rising levels of siltation have restricted the ferry operations in recent years – the service is governed by the tides and is no longer able to operate during low water. Recent decades have also seen the ferry’s fortunes buffeted and rocked by political turmoil – on many occasions the council-subsidised service has faced closure, only to be pulled back from the brink by a rising tide of public protest. As recently as this year, residents in Fleetwood and Over Wyre were worried the service might close after the Wyre Rose was taken out of service for several weeks following contractual wrangles. There was jubilation on both sides of the river when the vessel resumed sailing on April 13, after a new contract was signed between Wyre Council, Lancashire County Council and operators, Wyre Marine Services, as part of an eight-year plan to keep the service afloat. Pharos News, Fleetwood, Knott End Café, Knott End Post Office, Mr Greens, Dawn’s Cafe and the Visit Garstang Tourist Information Centre. Visit the Ferry Tales Facebook page.